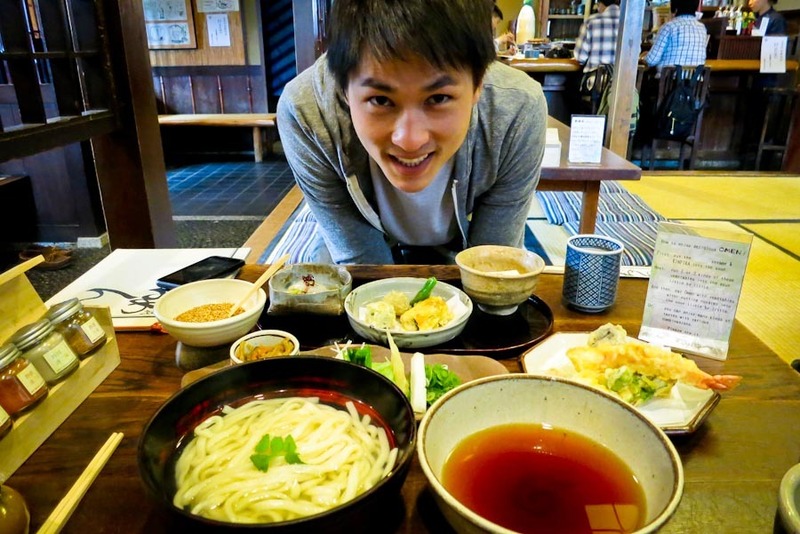 Eating out in Kyoto is a popular attraction in and of itself. Japan is one of my favorite food countries. It’s not simple, but rather refined. Simply put, it’s awesome and delicious. We ate well in Kyoto. Here are some of our favorite things we ate. 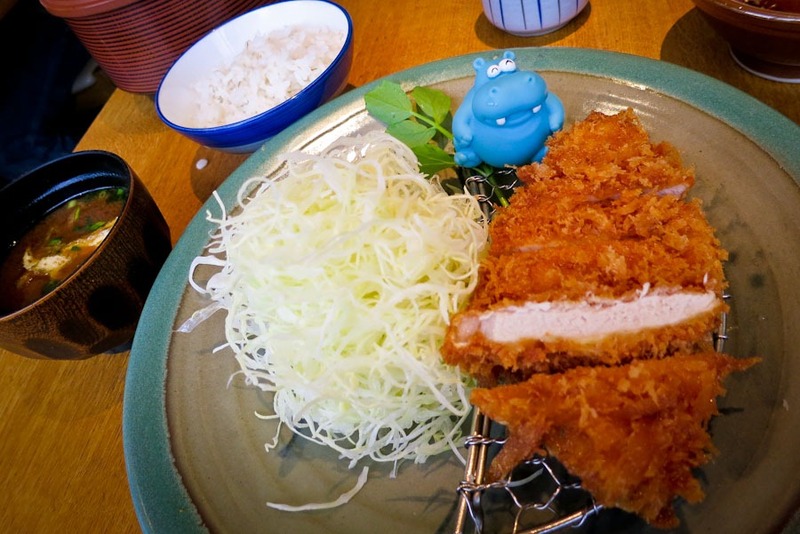 I love the Kyoto train station – it has everything from Department store shopping to delicious food halls where you can find some of the best fried pork katsu at Katsukura. Katsukura is located on the 11th floor in the Cube building attached to the Kyoto train station. We were a bit lost at first when they brought out a bunch of bowls full of sauces including a mortar and pestle and sesame seed. Eventually someone brought over a card, which told us how to mix our dipping sauce. The cabbage salad is all you can eat – scrumptuous and refreshing! On our way to Ginkaku-ji, we stopped by Omen and ordered their signature “omen” which consists of a bowl of udon noodles (available hot or cold), a bowl of tsuyu sauce and an assortment of seasonal Kyoto vegetables that are either boiled or pickled. Also to accompany, a side order of shrimp and vegetable tempura and agedashi tofu! I never tire of sushi in Japan, and Musashi was a frequent stop for us because its casual conveyor-belt sushi at an affordable price. 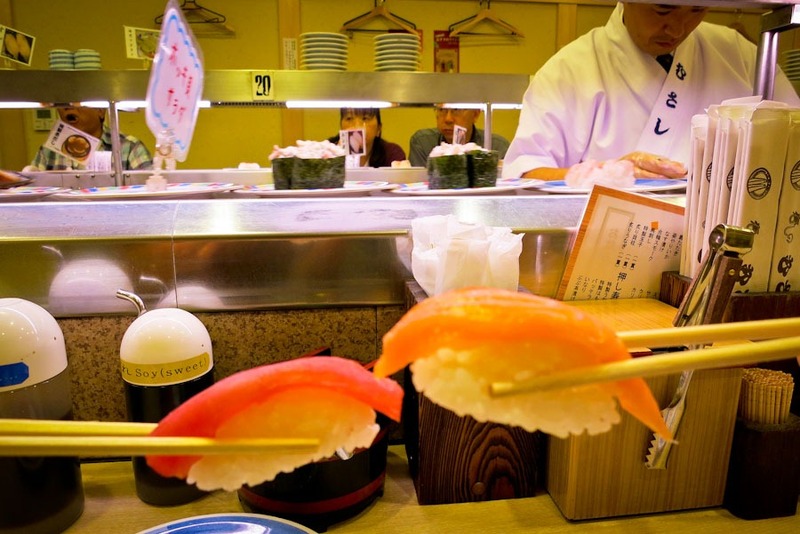 We’d typically spend about 1600 Yen ($20 USD) for the both of us on a satisfying lunch and order anything from fresh tuna to buttery uni and a whole lot of other specialty rolls in between. The Sanjo Street and Kiyamachi Street area is our favorite neighborhood in Kyoto. Lined with trendy restaurants, bars and coffee shops, it’s a popular late night hang out spot. 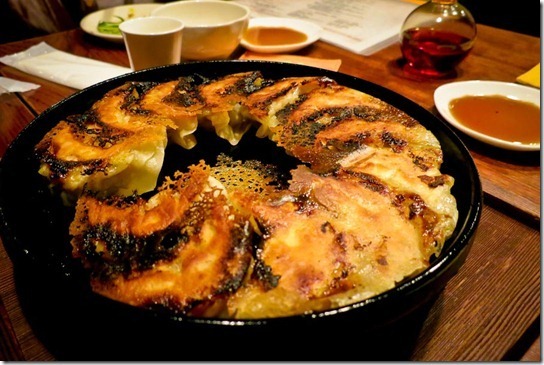 One of our favorite, a whole in the wall place, is Anzukko. Thanks to our Couchsurfing roommate Chenru, we had the best gyoza we’ve ever had. 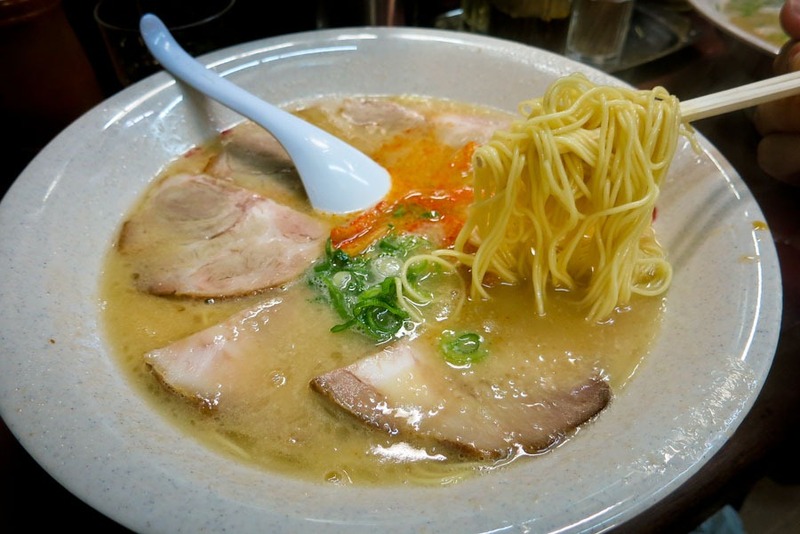 Hakata Nagahama Ramen Miyoshi serves ramen with pork bone marrow broth and it’s the best of its kind. 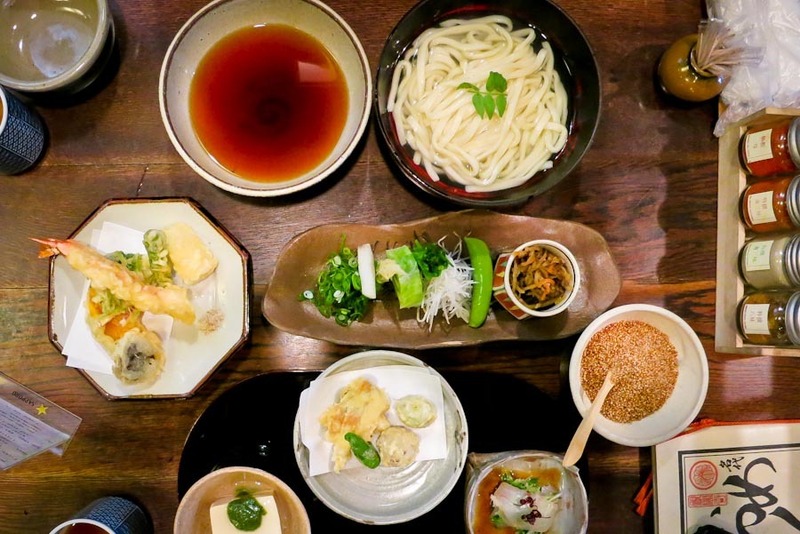 What’s cute and charming about this place is it’s open to the street – a half street stall, half ramen shop establishment serves up a no frills comfort in a bowl. The portions are huge but they wouldn’t allow us to share a bowl because of limited seating. 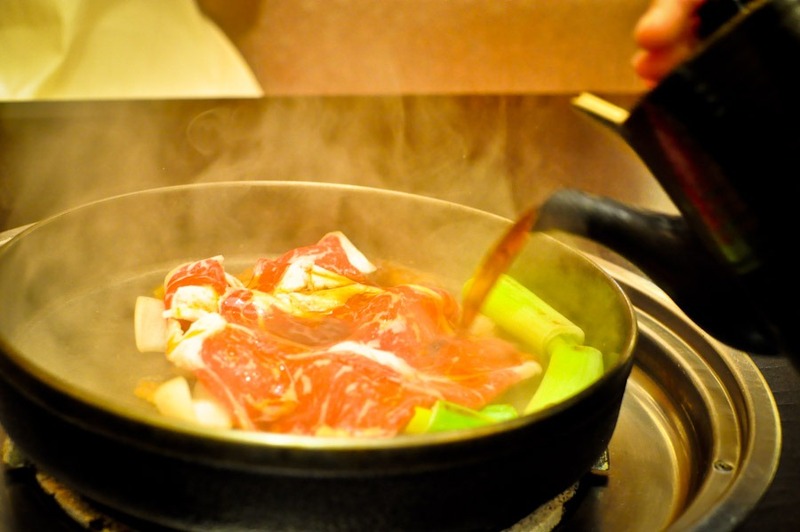 For the ultimate Japanese culinary experience, splurge on a shabu shabu or sukiyaki dinner. I know they both sound weird, but I guarantee you ain’t never had a meal quite like this. You’ll thank us later. Are you also visiting Tokyo? Be sure to check out our Tokyo food guide also! What would you like to eat the most in Kyoto? A Proposal in Prague. 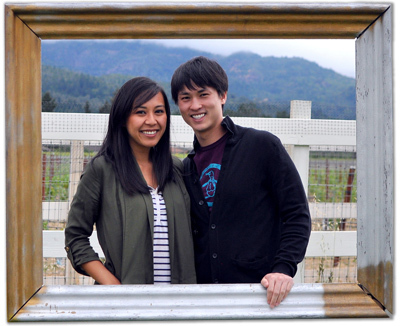 Yes, WE’RE ENGAGED! 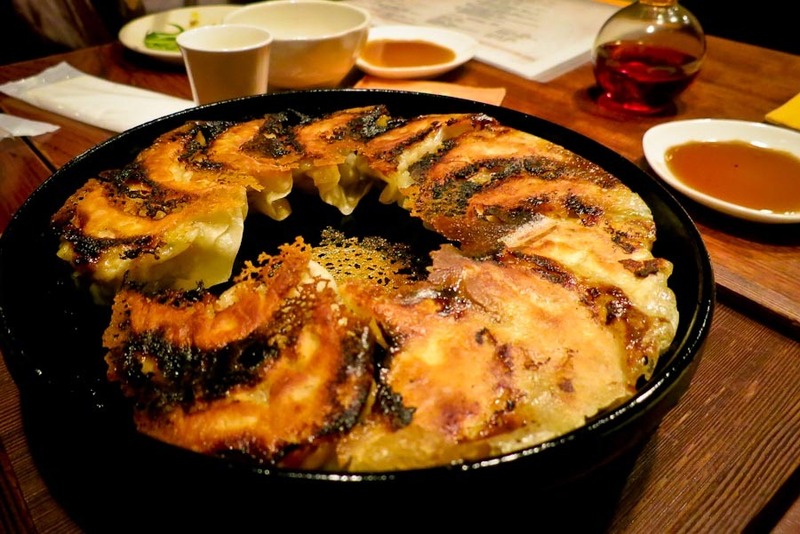 Those gyoza look ten times better than anything I have ever eaten in Toronto. They were AHmazing! Unlike any gyoza I’ve had in the States. Being allergic to seafood and Matt not being a big fan, it’d definitely be a factor in us visiting Japan! Would love to go, but may have to eat cookies the whole time haha! But always happy to read your food posts!! Phew!! That’s nice to hear since Japan is definitely a must on our list! I’ve been wanting to try conveyor belt sushi forever! 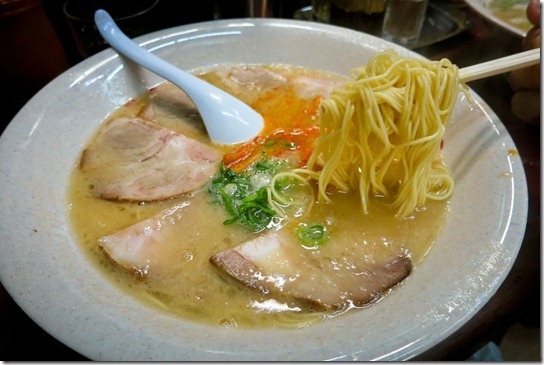 And that ramen looks amazing… now I’m craving Japanese. 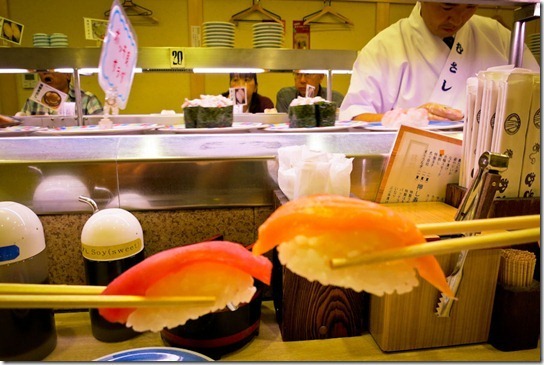 You’ve never had conveyor belt sushi?! Ah man, you’re going to love it! If you go, some also have the ones that will deliver on a tiny Shinkansen train.. so cute! The best thing I ever ate in Kyoto was hiyyayako – cold soft tofu with shoyu, negi, and bonito flakes on top. For some reason, it tasted like the best thing in the world at the time… maybe because we had been hiking around Kyoto for 3 hours in the July heat! Also, the ramen floor at Kyoto Tower can’t be beat. I’ve eaten ramen everywhere I could in Japan, and at home in Vancouver, BC, and it’s still the best I’ve ever had! Haven’t eaten Italian in Japan I am too busy eating the other stuff! Love everything you mentioned plus soba! I now keep a freezer full of soba noodles to satisfy my cravings.. LOVE SOBA! kyo-ryori is amazing there. it’s very delicate in flavors and it helps if you have a well developed palate [which i don’t always have]. I’d like to go back just to have another course of it! Ahhh so many great food, so little time. Another visit is definitely in order. 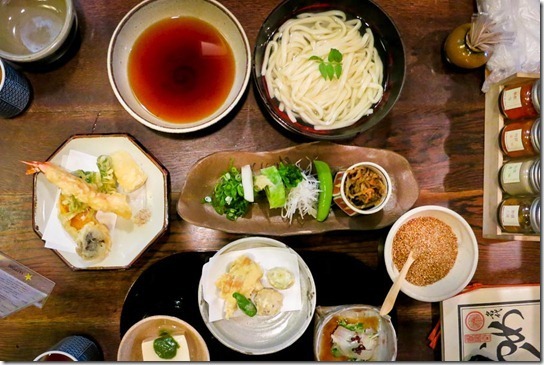 There is so much great food in Kyoto. I love the regional specific food especially. I’ve never seen so much matcha inspired food before. I’m also a big fan of the focus on seasonality and freshness.